6th Annual Evergreen's Got Talent! Name: 6th Annual Evergreen's Got Talent! Friday, October 12, 2018 at The Wild Game, 1204 BERGEN PARKWAY, BERGEN PARK in Evergreen Colorado! Talent show starts at 6 pm and runs until 9 pm with 12+ acts performing for donations to our favorite philanthropy, Operation Homefront. The director of Operation Homefront in Colorado Springs will be attending and educating the audience about the services Operation Homefront provides. They Serve, Their Families Serve, We Should All Serve. 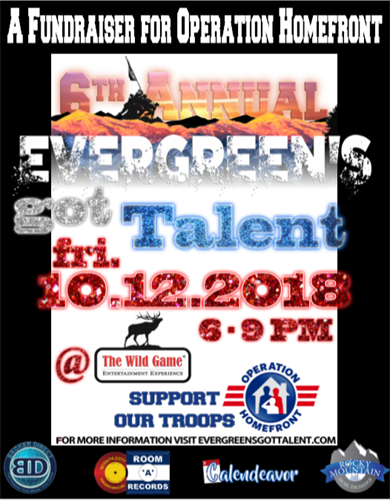 Go to EvergreensGotTalent.com for more information and to learn how to sign up. Performers must be less than 20 y.o. and have a referral from a talent coach or teacher. Thank you! This is a FREE event. Come have dinner and drinks which you'll purchase from The Wild Game. "Voting" for your favorite performer is by cash/check at the event OR vote up to one week prior to the event via credit card.